Moonbows in the lower section of Yosemite Falls are most often seen and photographed from the footbridge closest to the base of the falls on the Lower Falls Trail. The moonbow arc forms high and to the left of the base of the falls and slowly sinks down and to the right during the hours it is present. How do I calculate these predictions? Moonbows in the upper section of Yosemite Falls can be seen and photographed from numerous vantage points. The most popular location is the area surrounding the parking lot near Sentinel Bridge and the predicted viewing times have been calculated for this location. 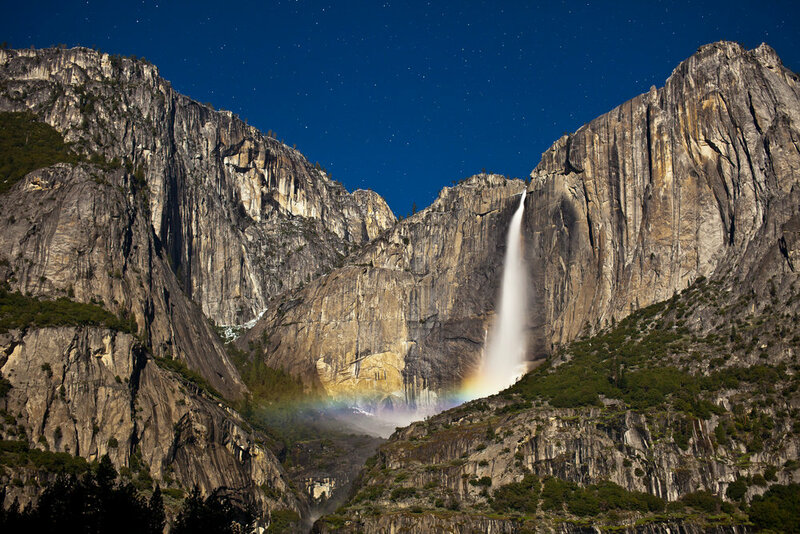 In April and early May, the moonbow in the upper falls is positioned very low, but may be noticeable if there is plenty of spray over the middle cascades. Late May and June are the best opportunities to see this moonbow. Moonbows seen in the upper falls from Glacier Point are rare since the road to Glacier Point usually doesn't open until late spring and you have to look for them at precise times. Since Glacier Point is farther from the falls, the moonbow appears wider and sweeps through the area of mist much faster. Consequently, the opportunity to see it is only about 15 minutes each night. The predicted times are for the optimal position within this short viewing window. Note for 2019: Due to heavy snowfall this winter, the road to Glacier Point may not open until late May. So, unless you’re willing to travel to Glacier Point by snowshoes, skis, or jet pack, you’ll have to wait until the Glacier Point Road opens to see this moonbow. Moonbows, also known as "lunar rainbows," are rainbows which form at night due to the light of the moon. When the moon is full and shining at the correct angle on the spray of a large waterfall, a moonbow can be seen arcing through the mist. John Muir wrote about their occurrence in Yosemite in the 1800s but only recently has their popularity increased due to photography. To learn more, check out this excellent video produced by Steve Bumgardner for the Yosemite Conservancy. The moon must be at the proper angle relative to the observer (see the predictions listed above for when and where to be to make everything line up). To the human eye, moonbows typically look dull and colorless, but with sufficient time to adjust to the low light, the colors will become apparent. To help your eyes adjust, turn off your flashlight and avoid looking at your smartphone screen. Consider using a flashlight with a low-power red light if you still need a little light to move around safely. The movement of the moon across the sky causes the moonbow to slowly change position over time and the moon rises approximately 50 minutes later each evening, so don't expect to see moonbows in the same position each visit. Moonbows are much easier for a camera to see than the unaided human eye. Most any camera with the ability to take long exposures can be used for moonbow photography, but smartphone cameras and fully automatic point-and-shoot cameras will not be able to photograph such dark scenes. Shutter speed considerations: Though it may be tempting to use a longer exposure time in order to reduce ISO or gain depth of field, an exposure time longer than one minute will cause the colors of the moonbow to blur together as it slowly changes position. Also, longer exposure times may not be practical if shooting from a location where mist is accumulating on the lens. The lower falls viewing area is often enveloped in the mist of the waterfall. Bring a microfiber cloth or squeegee to dry your lens between shots or blow the water off using compressed air. You might also consider using a hydrophilic filter, or coating an ordinary glass filter with Rain-X (you may want to avoid this for precious micro-coated filters, though). Also, cover your camera with a towel or plastic bag to keep it dry. Turn off the camera flash since it will ruin everyone's photo, including your own. Please keep the viewing areas dark to avoid ruining photographs and disrupting the enjoyment of the natural moonlight. Turn off your flashlight (or use a low-power red light instead) and shield your smartphone and camera screens. Turn off your camera's flash. Be aware of others around you, taking care not to block their view or bump their tripod. Wear a waterproof jacket at the lower falls, but avoid using umbrellas since they make it difficult for others to see or photograph. Consider viewing the upper falls moonbow first since its viewing times are generally about an hour before those for the lower falls. Avoid trampling the sensitive areas of Cook's Meadow when photographing the upper falls. As always, be safe around fast moving water and wet rock surfaces. Photographing moonbows combines my passion for photography, science, and the outdoors. As a former mechanical engineer, I started making my own 3D simulations of Yosemite Valley in 2011 to discover new places to photograph moonbows and the best time to be there. I hope this information is helpful to you as well. Say hello if you see me in Yosemite this spring, or reach out on social media to stay connected.